When it comes to furniture, we have a vast selection to choose from that accompanies any lifestyle. Whether you’re looking to completely redesign an entire room in your home or looking for a unique accent piece to tie the room together, we know you’ll find something at Curate Consignments. We not only offer the best prices for our high-end pieces, but we only accept the best, most well-cared-for consignment furniture that is clean and in good condition. Conveniently located in South Fort Collins, our showroom is open six days a week. Come see us — we can’t wait to meet you! 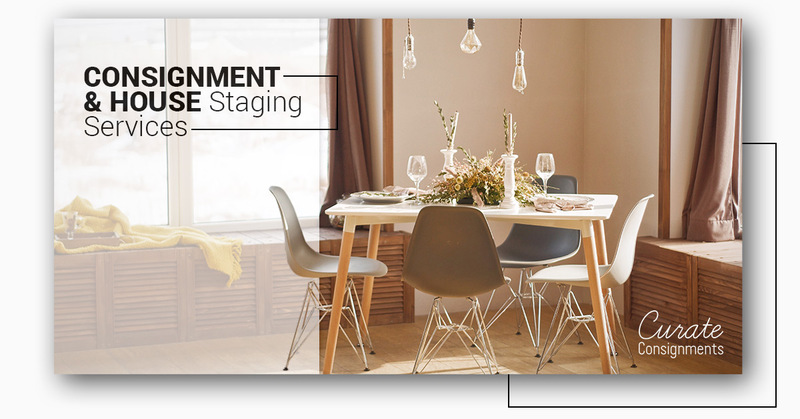 If you’re selling your house and want to have all of your furniture packed up and ready to move, but would like the benefit of being able to show your home with furniture in it, we have just the solution for you: house staging. Curate Consignments proudly offers a furniture rental service to specifically address the needs of home sellers and real estate agents. Home staging makes an impact on potential buyers and could get your home sold quickly. But maybe you’ve already bought another house and are wanting to take your personal furniture with you. Maybe you just want to have it all packed up and ready to go for when you find that new home. Maybe you just don’t want strangers sitting on your couch and potentially getting your furniture dirty. Or maybe you’re a bit embarrassed by your furniture and want to be staging your home with something a little more classy. Curate Consignments provides high-end, beautiful, and clean used furniture for home staging, giving it that added touch to convince potential buyers to act and buy your home. Contact our expert home staging team now for more information and a free quote. Soft, cozy, clean, and sophisticated furniture make any room inviting, allowing you to enjoy home in your own particular style. At Curate Consignments, we carry a variety of large furniture pieces as well as accent tables and smaller elements that can perfectly tie the room together. If you’re wanting to make your home feel more personal, small accent pieces and a bit of decorating might be all you need. Our consignment and home goods store is managed by trained and certified designers who specialize in making rooms look great while keeping a comfortable, homey feel. We keep a variety of home accessories and small accent pieces on hand for when you are looking for just the thing to add sophistication and style to any room in your home. Consigning your pampered and well-cared-for, unwanted furniture is easy with Curate Consignments. We’ve streamlined the entire process just for you, seamlessly handling every aspect of selling your high-end pieces. Whether you’re going with a different design for your home, moving, or downsizing, we are happy to help. Call us today with any questions about our consignment process. Our inventory changes constantly, so stop in often to check out our new pieces. Our team strives to find you exactly the look you’re searching for. Contact us soon!